WHAT: Demonstration outside the Embassy of Cyprus in Washington DC in solidarity with Iranian and other refugees detained in Larnaca, Cyprus who came under barbaric, unprovoked attack by Cypriot authorities on 12 July 2011. The protest will include photo exhibits of injuries sustained by the refugees. Informational flyers will be handed out to the public. 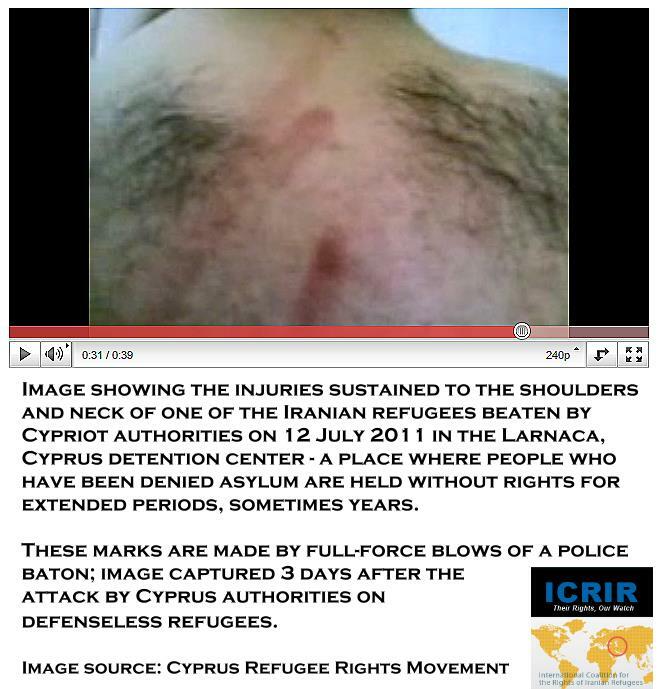 BACKGROUND: On Tuesday, 12 July, 2011, approximately 35 police officers and other Cypriot authorities violently assaulted a group of Iranian and other refugees held in Larnaca detention center. During the attack, the Cypriot authorities threatened the refugees with handguns and used batons and brass knuckles to brutally beat the refugees, including an elderly 72-year old asylum-seeker, who was transferred to solitary confinement after the beatings. He, along with his family, was deported to Iran in the following days. One refugee is reported to have sustained a broken leg, for which he finally first received medical treatment 10 days after the attacks. Neither the government of Cyprus nor the UNHCR has taken any substantive action with regard to these illegal attacks on defenseless detainees held for migration-related reasons. A Cypriot government that flagrantly violates fundamental human rights should not expect to assume the Presidency of the European Union in 2012 without opposition.